You say tomato I say Greek Salad please! I love Greek food, probably more than any food I have ever had anywhere. Perhaps it is because my first visit to Greece was the first time I had ever really found out what a tomato should could taste like. English tomatoes never taste the same, however we do have a habit of storing them in the fridge and I was told, in St Kilda at a farmers market, that is the quick way to killing the flavour. And I think we also over water them here, I have watched Greeks just splash some water on their plants in the morning and that is it. And this is what they grow. Of course, you never forget your first moussaka, do you. Although the one I had in Heraklion, or the stuffed vegetables that Phil and I ordered with it, didn’t forget us for a couple of days. The only bout of food poisoning we had and not too severe, thank goodness. I will avoid Pantheon in Heraklion in future. With raw ingredients like this it is really hard not to produce good food. We had a Greek Salad with almost every meal. It is obligatory really. I hate olives but Phil loves them so they get pushed to his side of the plate. Yet I will pour a gallon of olive oil over the tomatoes then use the bread to soak up any excess. Then there is souvlaki.This was my first meal in Santorini at Fanari, in Fira. And meat balls. Phil chose these in Heraklion at Kastella and at Fanari. Flavoured with a herb we could never quite put a name to. We were told it was mint but think it was this. Do you know what it it? Cant’t decide? Have a meze. This was the offer at Palazzo in Rethymnon. (It doesn’t get great reveiws here, yet we enjoyed our lunch). Meat lover? A mixed grill to share? This one from Byzantino in Plaka Athens was lovely, we spent 3 hours people watching while wading through it. We really struggled to eat later that night. Indeed we didn’t, just water and a coke for supper. 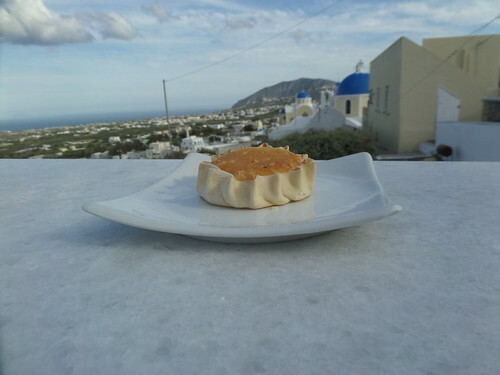 If you are Heraklion these from Kastella overlooking the beach are to die for. Really what is not to like? And if you only fancy a light snack there are plenty of shops and street vendors selling pasties and cakes. And when you can’t eat any more, this comes out, with Raki, on the house. Oh, I will make room for that! And if you stay at Nectarios Villas at Easter, you may get some of these. What is you favourite food in the world? This entry was posted in Europe, Food, Greece, Travel and tagged Crete, Greek Food, Greek Salad, Santorini, Souvlaki by Travelling Coral. Bookmark the permalink. I love Greek food, too. Every part of Greece has special dishes. Olive oil is so healthy and I love the Greek tomatoes, too, because they have grown in the sun and that’s the reason, why they are so sweet and good. But many countries have good foods. I cook international: Greek, Italian, German, Indian, Chinese, Japanese etc. I pretty much love most cuisines, yet the Greek salad, ate in Greece still remains a favourite. Not had time to investigate the herb, but lovage could be it.